Patients may present a tooth that previously had a root canal and is now causing pain and discomfort. Treatment may be to attempt a root canal retreatment or extraction of the failing endodontic tooth and replace with a dental implant and crown. Which one to choose, root canal retreat or extraction? Consider real life scenario A: Patient “Mary” had a root canal and a crown on a lower right molar a few years ago. The tooth became symptomatic, and upon evaluation and x-ray bacteria had infiltrated the root canal and was reinfected. Mary consulted a well respected endodontist, and the two decided to treat the tooth with a root canal retreat and apico surgery. The tooth’s symptoms resolved; three years later pain and swelling came back where I saw the patient for an evaluation of the tooth. 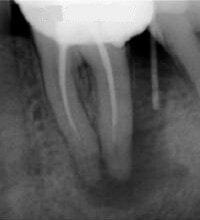 X-ray showed infection (radiolucency) around the retreated root canal tooth. Mary was presented two options at that time: go to an endodontist to have the tooth evaluated for retreatment or extraction and implant, or try antibiotics to resolve the swelling. Mary elected the antibiotic route and was placed on broad spectrum antibiotics; 2 weeks later the pain persisted where Mary was then seen by an endodontist. The endodontist concluded that one of the roots had excessive resorption and probable fracture, and recommended extraction with future implant. Let’s then consider real life scenario B: Patient “Todd” had a root canal and crown on a lower left molar a year ago. Though the tooth presented with no symptoms, a routine x-ray suggested the tooth’s root canal was beginning to get infected. Todd was referred to an endodontist, who determined the tooth was beset treated with a root canal retreatment. Upon endodontic retreatment and currently four years later the tooth remains symptom free with a x-rays showing the tooth with crestal bone healing. So in what situation is it feasible to retreat the failing root canal? Or is it more worthwhile to just extract the tooth and replace it with an implant of bridge? Each situation is clinically different and would likely depend on the extent of the infection, how extensive the symptoms, amount of bone loss surrounding the roots, periodontal disease involvement, and the history of the tooth. If you have a tooth that previously had a root canal and have been experiencing discomfort and/or swelling, be sure to consult your dental professional and have the tooth evaluated for restorability.